Mohammad Abbas ripped through Pakistan to claim his first 10-wicket Test haul as Australia crumbled to a crushing 373-run defeat and a series loss in Abu Dhabi on day four. 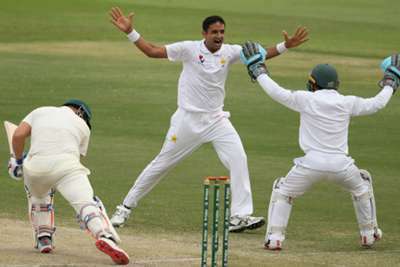 Abbas has been the scourge of Australia in the United Arab Emirates, taking seven wickets in a drawn first Test and bowling Pakistan to victory with match figures of 10-95 at Sheikh Zayed Stadium. The seamer took 5-62 on Friday as the tourists were skittled out for only 164, failing to produce another great escape after salvaging an unlikely draw in Dubai last week. Asad Shafiq captained Pakistan in the absence of Sarfraz Ahmed, who was taken to hospital for a check-up after being struck on the helmet while batting on day three but was cleared to watch his team-mates seal an emphatic win. Australia were indebted to Usman Khawaja after he scored a brilliant defiant century in Dubai, but the opener was unable to bat on the penultimate day due to a knee injury that requires surgery and could keep him out of the home series against India. Marnus Labuschagne top scored with 43 for Tim Paine's side, but Abbas and Yasir Shah (3-45) made light work of wrapping up a triumph that pushes Australia down to fifth in the rankings. ALL OVER! Pakistan too good in Abu Dhabi to take the series 1-0. Australia's slim hopes of thwarting Pakistan again all-but disappeared in quick time after they resumed on 47/1, Abbas doing the damage in a magnificent spell. The seamer ended a second-wicket stand of 61 by tempting Travis Head (36) to fish outside the off stump, stand-in wicketkeeper Mohammad Rizwan taking the catch. Mitchell Marsh failed for the fourth time in the series, Abbas getting one to nip back in and trap the all-rounder leg following a review after Richard Illingworth initially decided against raising the finger. Aaron Finch (31) added just seven runs to his overnight tally before he fell in the same fashion during the next over from the brilliant Abbas. Paine became Abbas' fourth victim, shouldering arms to a ball that jagged back in off the seam, reducing a teetering Australia to 78-5. Mitchell Starc and Labuschagne offered some resistance with a partnership of 67, but Yasir snared the paceman lbw and Peter Siddle soon followed when he was struck in front with lunch looming. Lyon would also have been on his way if Pakistan had reviewed when he was rapped on the pads by a full-length delivery from Yasir in the first over after lunch, but that was never likely to be costly. Abbas had a fifth wicket when Labuschagne was caught behind on the hook and Yasir punched the air after Jon Holland edged him to Haris Sohail at second slip to end the match early in the afternoon session.